To order prints on photo paper, please select a photo and enter the name of the photo in the Print PayPal button and choose the size from the dropdown. All prints are printed on professional papers. They are matted (sizes shown) with acid free mat and foam core board, making the prints ready for standard size frames. The photos will remain fade free for a lifetime. Shipping charges range from $1.80 to $10. The small prints are shipped via USPS. Larger prints are shipped via Fed Ex or UPS. NOTE: Shipping charges are already included in the price. All canvas photos are gallery wrapped with 1 1/2" frames. The canvas material gives photos a visual depth that is not available on any other printing material. The prints are coated to protect them against fading. They can be cleaned with a damp cloth. Canvas prints are delivered ready to hang. There is no shipping charge for canvas prints. The price below includes shipping charges throughout the continental United States. Dye Infused Aluminum is the newest surface for photographic printing. Photographs printed on Dye Infused Aluminum use a high heat, sublimation process to fuse the photograph to the aluminum. The result, when using a high gloss polished aluminum surface, is a stunning, vibrant image startling in its depth, detail and color. Dye Infused Aluminum prints are delivered ready to hang. There is no shipping charge for Dye Infused Aluminum prints within the continental United States with the exception noted below. EXCEPTION: Sizes 30x45 and larger require individual shipping crates and will incur a charge for crating and shipping. Photographs printed on a face mounted acrylic surface give one the feeling that you are looking at the scene live. There is a 3-D vibe to this type of photograph. The photographs are beyond vivid. The details are incredibly sharp and the colors strikingly rich. The price includes shipping charges within the continental United States. Select the size of cutting board you wish to order from the dropdown. Select an image from one of our many image galleries and enter the image name in the text box. Each photograph is printed at 12"x18". They can be printed on canvas or the new Dye Infused Aluminum. They can be displayed individually or in any grouping of your choice. Use the PayPal button below to order a set or an individual photograph. If you are ordering an individual photograph, be sure to include the name of the photograph in the text field. 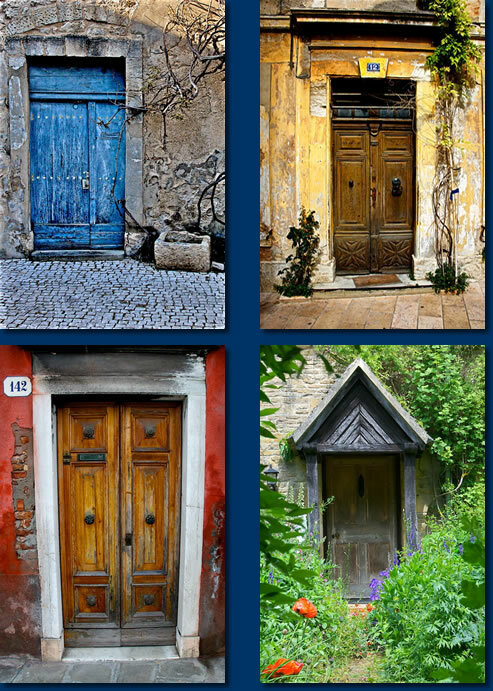 The names are: (Left to right) Blue Door; Door at 12; Red Door; Cotswold Door (greenery).